With great delight and Joy Blossom World Society welcomes Ms Priscilia Koh on board as Honorary President. 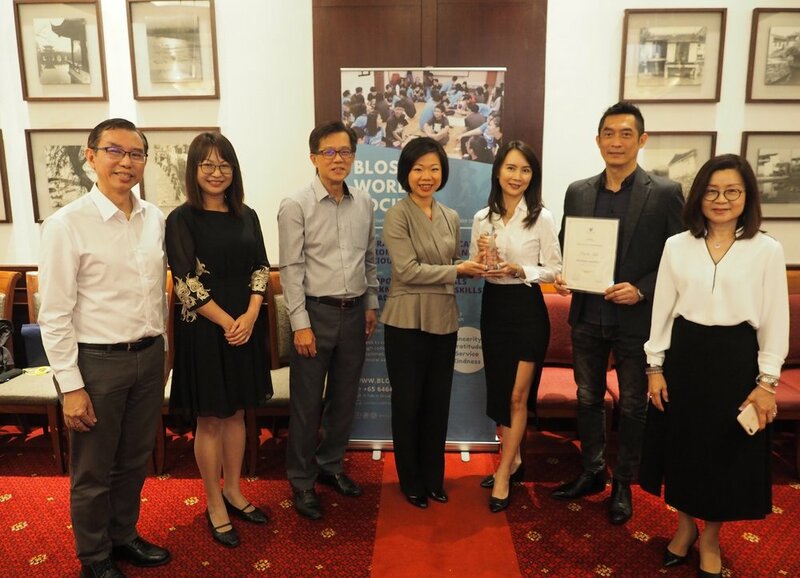 Our Honorary Advisor, Ms Sim Ann who graced the Ceremony of Appointment, appointed Ms Priscilia Koh, Director of Old Street Bak Kut Teh as the Honorary President of Blossom World Society in a Ceremony Of Appointment today (12 April) over a lunch session. We are grateful to Ms Koh for her unwavering effort in fund raising and supporting the development of our programme. As we welcome Ms Koh onboard, we have reached another major milestone in our history. The programmes of BWS define what it is and the addition of such strong support is testament to the results which our programme has produced as we can see from the sharings below. Patricia, Age 29, has been with Blossom World Society for over 10years. She was exposed to a lot of values in community work and subsequently discovered that they can also be applied at home. BWS emphasises on family harmony really relates to her so she feels that she can really learn from BWS. Bing Bing, Age 27, has been with Blossom World Society for over 9 years. Left her hometown in Putian, China when she was 18 to study and work in Singapore and she needed a lot of emotional support back then. BWS gave her the support she needed and eventually, she got her PR status. She wants to give back to society as she has received a lot of help. She felt that she received many things in BWS which cannot be bought by money - priceless friendships and learning opportunities. These include helping her to mature emotionally and also how to be a good parent through exposure to the valuable perspectives of Chinese Classics. Yan Ning, Age 30, has been with Blossom World Society for over 9 years. She learnt how to look at the purpose in our approach to the things we do, rather than merely focusing our attention on what we do. One key tenet of BWS is that they take that extra step to touch the hearts of volunteers instead of merely ensuring that the operations run smoothly. Her experiences here have helped her to mature and become a better child to her parents and a better colleague in her workplace. Hence, she always feels good about BWS. I have been attached to Blossom World Society (BWS) as an intern for about a month thus far. I am honoured to attend such an momentous ceremony for BWS. I was pleasantly surprised to be invited and even introduced to the esteemed guests. This greatly reflects how inclusive and special BWS is. I am thankful to be a part of this wonderful community of good-hearted people. Thank you BWS! Want to know more from our youth about what they have learnt and also the reason which made them stay on in the society. Click on here to find out more.